College recruiting is constantly evolving and can be a complex and sometimes confusing process. Without a RECRUITING PLAN, you are rolling the dice that your athlete will be "discovered" and recruited. 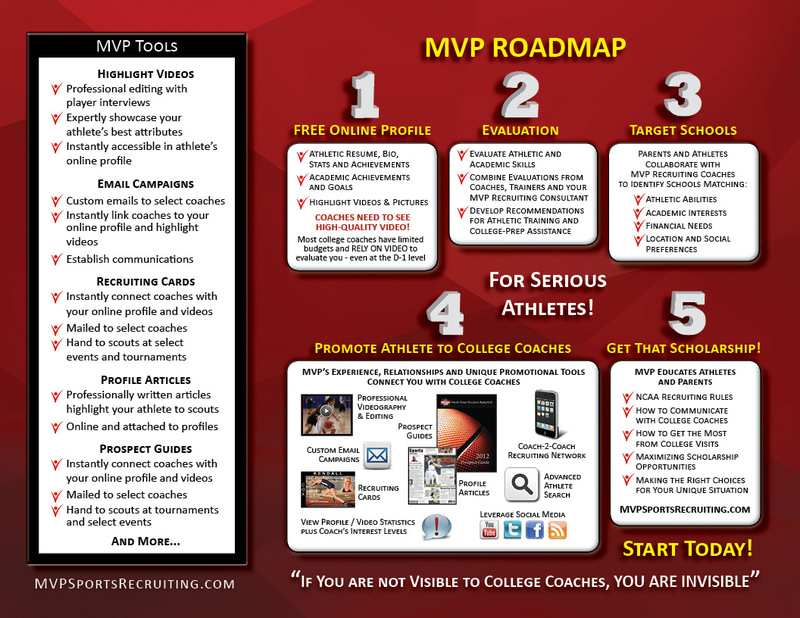 MVP Recruiting Coaches will customize a RECRUITING PLAN and guide you through the entire process. Our mission is the best possible recruiting outcome for you! Athletes often assume they will be discovered at tournaments or college showcases. 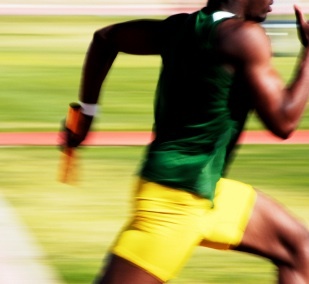 If your child is a gifted Division I athlete, college coaches will probably find him or her. However, most athletes will have to reach out to college coaches and promote themselves. In todays Internet age, parents need to create an online presence to tout their athletes abilities. The site should include an academic profile, sports bio, current statistics, accomplishments, coach's recommendations, tournament schedules and highlight videos. Parents should promote their athletes site to select coaches through email and other unique methods linked directly to their online profile and videos - then follow-up once a connection is established. Have you ever wondered why some players get scholarships, while better players do not? With limited budgets and resources, college coaches do their best to identify and evaluate talented student athletes who can help their programs. This means that highly-visible athletes get recruited while less-recognized athletes are left wondering why they were overlooked. The reality is that most high school coaches have limited contacts and resources to promote all of their capable athletes to the schools they want to attend. Most high school coaches have 3 (or fewer) personal college coaching contacts. According to the NCAA, only 2% of high school athletes (roughly 130,000 kids) are awarded a portion of ~ $2 billion dollars in athletic scholarships each year. To have a chance at a full or partial scholarship, it is absolutely critical to market and promote your student athlete so they are highly visible to college coaches. We maximize your athlete's visibility by sending custom emails, recruiting cards and prospect guides directly to coaches; we link directly to your online profile and add professional highlight videos and feature articles to showcase your talented athlete. 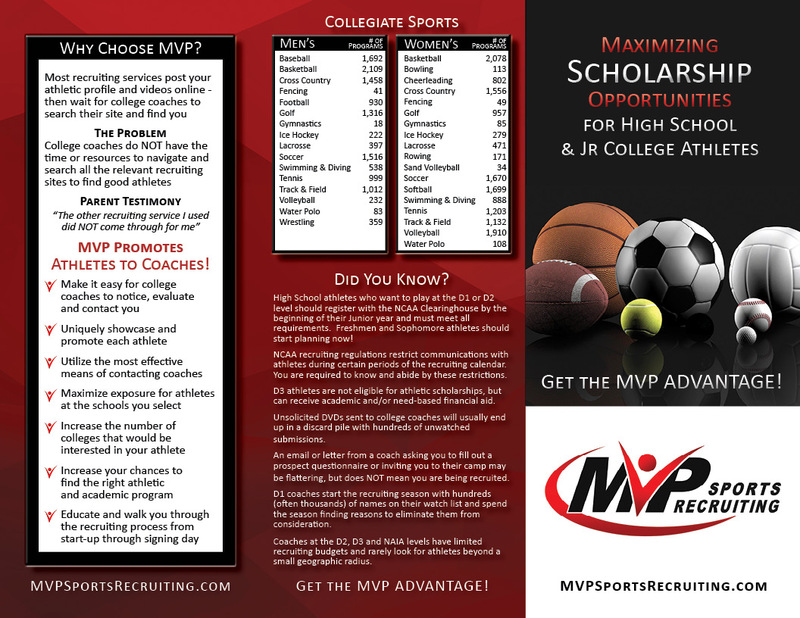 MVP services are designed to ensure your athlete is highly-visible to college coaches and that they have immediate access to all the information needed to evaluate and recruit your athlete. Your personal MVP Recruiting Coach will walk you through the recruiting process and help you comply with NCAA guidelines. We alert you when coaches look at your athletes profile, put him/her on their interest list or view your highlight videos. Then, when coaches contact you, we will help you follow-up, start building relationships and maximize your scholarship opportunities. You will want to start early to ensure you are taking the right (required) courses, developing your skills and getting on the radar at the schools you want to attend. While the Junior year is critical, most athletes who are serious about maximizing their opportunities start the recruiting/promotional process as Freshmen or Sophomores to ensure they are on the coach's radar when important evaluations and recruiting decisions are being made.